The first two of four new 20,000dwt self-loading/unloading cement carriers for Thai owner Precious Shipping has recently been delivered; it features a MacGregor cement loading and unloading system with a rated capacity of 1,000tph. Bulk carriers deliver the majority of raw materials needed for construction, production processes and power generation. A vessel equipped with a MacGregor self-unloading or deck conveyor system offers efficient, reliable and dust-free bulk transfer. MacGregor systems can handle many dry bulk commodities from powdery cargoes, such as cement and sulphur, to highly abrasive ones such as coal and iron ore. One of the most recent vessels to benefit from such a system is the first of four 20,000dwt cement carriers, Apinya Naree, which was delivered in March 2014 from China Shipbuilding Industry Corporation’s enterprise, Shanhaiguan Shipyard. 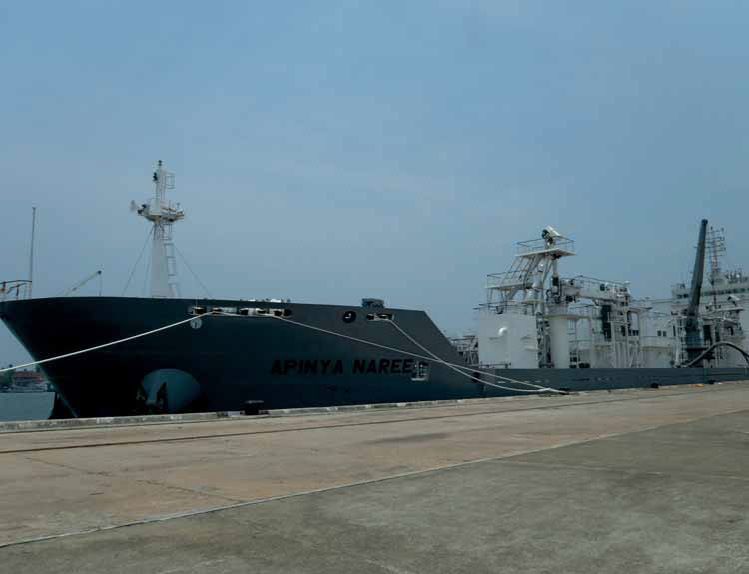 The second vessel of the series, Boonya Naree, was delivered on 12 June 2014. The vessels will each feature an autonomous MacGregor loading and unloading system and are all destined for Thailand-based Precious Shipping Public Company Limited (PSL), a pure dry cargo shipowner operating in the small Handysize and Supramax sectors of the tramp freight market. The remaining two ships, Chanya Naree, and Danaya Naree, are scheduled for delivery before the end of this year. The 149m vessel will have four cargo holds, each divided into two compartments. The cement handling system is designed to accommodate two grades of cement. The ship can be loaded mechanically or pneumatically. It can be discharged mechanically to shore receiving conveyors or directly to tank trucks, or pneumatically in pipelines direct to silos. All surplus air from the cargo holds both during loading and unloading is evacuated by means of dust collectors installed on deck. This ensures a clean environment for the crew and port. During mechanical loading, material is distributed from the shore to the ship’s receiving system via a flexible bellows system. The receiving aeroslide divides the cement flow forward or aft into a horizontal screw conveyor positioned along the ship’s centre line. The horizontal screw conveyor’s transport screw is divided into a forward and an aft section. The forward conveyor screw transfers cement to holds 1 and 2, whereas the aft conveyor screw loads holds 3 and 4. The screw conveyor has two outlets for each hold. Beneath each of these, except for the end outlets, is a sliding gate. Each hold also has four inlets, two on the port side and two on the starboard, for pneumatic loading directly from self- discharging trucks on shore. During pneumatic loading, material is distributed from the shore to the ship’s receiving hopper via two pipelines. On deck a distribution pipeline system is fitted with directional valves to direct the incoming cement to the chosen hold. Level indicators inside the hold notify the operator when the hold is full. For reclaiming cement from the holds, sloped aeration panels are installed on the tanktop in each hold. By blowing air through the fabric of the aeration panels, the cement becomes fluidized and flows towards the centre of each hold. A vertical screw conveyor is installed inside a trunk at the centre of each hold. The fluidized cement is fed into the vertical screw conveyor via a transfer box equipped with two remotely- controlled flow-control gates. The vertical screw conveyors elevate the cement above deck and discharge it into the horizontal screw conveyor, running along the ship’s centre line. By reversing the rotational direction of the horizontal screw conveyor, cement is conveyed to midship. Pneumatic discharge of the cement from the horizontal screw conveyor is via a buffer hopper placed inside the pump room. Cement from the buffer hopper is then fed to the blow pump system, which conveys it to silos on shore through two pipelines. Mechanical discharge of the cement from the horizontal screw conveyor is via two further transfer screw conveyors installed on deck. The transfer screw conveyors move the cement to two bulk discharge boom conveyors located on the ship’s side. Bulk discharge booms are slewed out over the ship’s side and connected to the tank trucks on shore by means of flexible bellows. MacGregor offers world-leading engineering solutions and services for handling marine cargoes and offshore loads. The scope of its integrated packages is growing and now also includes Hatlapa, Porsgrunn, Pusnes and Triplex products. MacGregor serves the offshore, maritime transportation and naval logistics markets in ports and terminals as well as on board ships and rigs. MacGregor solutions combine load and cargo access, stowage, care and handling functions to optimize lifetime profitability, productivity and environmental sustainability. MacGregor is part of Cargotec. Cargotec’s sales totalled approximately €3.2 billion in 2013 and it employs approximately 11,000 people.